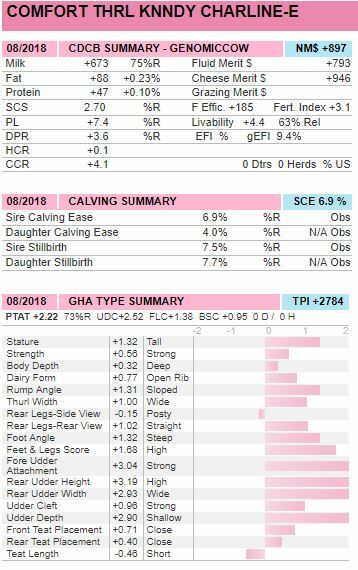 Early +2784, CM$+946 Kennedy daughter with huge components, +.23% Fat and +.10% Protein combined with elite health traits (PL +7.4, Livability +4.4, DPR+3.6) and very balanced type index (+2.52 UDC, +1.38 FLC)... Don't miss out this exciting Kennedy x Bayonet x Commander x MAKEA offering! SCS 2.78 / PL +7.0 / DPR +2.7 / SCE 7.0% and very balanced type proof! 14th Pen-Col Reflector Misty VG-88-USA 4yr.